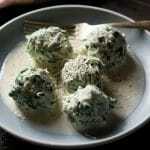 An absolutely delicious recipe for broccoli rabe and ricotta gnudi with a simple parmesan cream sauce. Light and soft gnudi that melt in your mouth with the most amazing cheesy sauce, a special dinner without the effort. First, add the broccoli rabe to boiling salted water and turn off the heat straight away. Make sure all of the broccoli rabe is covered by the hot water, leave it to soak for 2 minutes then drain. Place the broccoli rabe in a clean tea towel and squeeze out as much water as possible, finely chop. Add the chopped broccoli rabe, egg, garlic, flour, parmesan, salt, pepper and nutmeg in a large mixing bowl. Mix all the ingredients together until thoroughly combined. Using wet hands roll one tablespoon at a time of ricotta gnudi mix into balls (the balls don't need to be completely smooth and perfectly shaped) and place them on a large plate or tray. Sprinkle the gnudi very lightly with flour and place in the fridge for half an hour. Pre-heat the oven to warm (to keep the gnudi warm whilst making the sauce). To cook the ricotta gnudi, bring a large pot of salted water to a boil. Carefully drop the gnudi into the water and turn the water down to a simmer. When the gnudi float to the surface, let them cook for an extra 30 seconds then remove them with a slotted spoon and place on a warm plate, keep them warm in the oven. To make the parmesan cream, fry the chopped garlic in a small frying pan with the olive oil. Fry the garlic for a few seconds, just before it becomes golden add the cream. Bring the cream up to a boil and let it boil for one minute. Turn the heat down and add the parmesan, salt, pepper and nutmeg. Simmer the cream and let the parmesan melt for 1 minute or until it's thickened slightly. Spoon the cream onto serving plates and top with the gnudi, sprinkle with an extra grating of parmesan and pepper then serve. Broccoli rabe can be substituted for spinach. The gnudi can be made one day in advance and kept in the fridge.